Enerfac Inspection Services are an integral factor in successful project management, because it requires personnel with experience, expertise, certifications and relevant training. Energy Facility® offers inspection personnel with the appropriate credentials necessary to verify compliance with customer specifications. These include AWS certified welding inspectors, NACE certified coating inspectors, API and ASME qualified inspectors, as well as ASNT rated inspectors. This guarantees the highest level of performance by contractors in any marine construction, subsea or pipeline environment. Our inspection personnel have been involved in ultra deep water pipe lays, J-lay operations, directional drills, beach approaches, river crossings, high temperature, and H2S pipelines. Platform, deck and module construction, metering facilities, pressure vessels, interconnecting piping, along with instrumentation and electrical inspections, have been performed by Energy Facility® inspection personnel, often in conjunction with the C.A.T.S.® (Construction Automated Tracking System) program. Energy Facility® Inspectors have worked in pipe mills in the U.S., Mexico, Japan, Germany, France and Norway, as well as in coating yards using the entire spectrum of applications. 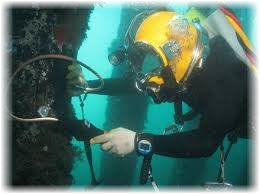 Inspection of underwater construction is carried out by our personnel, who have expertise in diving, ROV, and One Atmosphere diving suit operations, and have included platform inspections, hyperbaric weld repairs, tie-ins, platform removals, riser installations and hot taps.